2 In the UK, there are around 3.8 million people who have diabetes. There are 3 million people living with Type 1 and Type 2 diabetes, and around 850,000 more who have Type 2 diabetes but don’t know they have it because they haven’t been diagnosed. As many as 7 million people are at high risk of developing Type 2 diabetes and if current trends continue, an estimated 5 million people will have diabetes by 2025. 3 Diabetes is a condition where there is too much glucose in the blood because the body cannot use it properly. If not managed well, both Type 1 and Type 2 diabetes can lead to devastating complications. Diabetes is the leading cause of blindness in people of working age in the UK and is a major cause of lower limb amputation, kidney failure and stroke. 4 People with Type 1 diabetes cannot produce insulin. About 10 per cent of people with diabetes have Type 1. No one knows exactly what causes it, but it’s not to do with being overweight and it isn’t currently preventable. It usually affects children (like the little girl pictured above) or young adults, starting suddenly and getting worse quickly. Type 1 diabetes is treated by daily insulin doses - taken either by injections or via an insulin pump – a healthy diet and regular physical activity. 5 People with Type 2 diabetes don’t produce enough insulin or the insulin they produce doesn’t work properly (known as insulin resistance). 85 to 90 per cent of people with diabetes have Type 2. 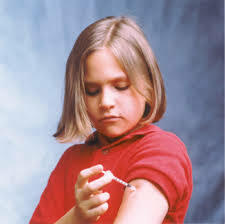 They might get Type 2 diabetes because of their family history, age and ethnic background puts them at increased risk. They are also more likely to get Type 2 diabetes if they are overweight. It starts gradually, usually later in life, and it can be years before they realise they have it. Type 2 diabetes is treated with a healthy diet and increased physical activity. In addition, tablets and/or insulin can be required.